01.I was born in this house in 1949. That house was demolished around 1970 and what was left is this story and the image saved in my memory and recalled here. 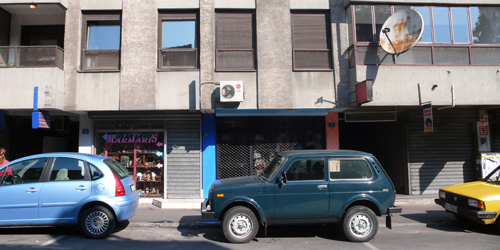 Street plate that stud on our house was 15 Galsworthy Street [in Beograd, Srbija]. Nobody ever, even today, 60 years after it was changed is calling this street other than Stiska after a Stig large plain along river Danube south shores where this former road was leading. 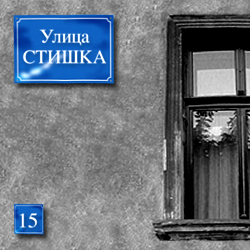 This story is therefore about house in Stiska 15. 02.In this small, ground floor only, house I lived with my mother and father, my grandmother Anka my mum's mum, and my two sisters. All three of us kids were born here. 03. This house originally belonged to my grand grand father Radule Bojovic, who built it around 1890. My grand mother Anka was born here in 1894, see photo left. Radule was well respected machine-locksmith. It is quite difficult to translate his title or make relation with contemporary occupations. We in the family still have one very small rifle made by him. Few small mysterious measuring devices can be still found here and there around my house. There was a small shack like room in the back of the yard. It was full of some machinery and tools that belonged to Radule. He already passed away when I was born but he was still very well present everywhere. 04.Radule was brother of very famous Serbian duke [Vojvoda] Petar Bojovic, who become famous after the Balkan wars between Turkey and Serbia, and especially after the first world War which effected, as you will see, our family significantly. My grand grand father was married twice. From his first marriage with Jelena he had my grand mother Anka. 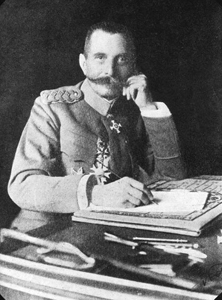 With his second wife, also Jelena [the second], after the death of his first wife, he had son Aleksandar. o5.Anka, my grandmother, has her own story. Her future husband let her retreat, alone and pregnant, thru perilous Albanian mountains with Serbian army after the terrible attack and defeat by many times larger Austro-Hungarian army. This was at the beginning of first world war. She delivered her first baby in 1915 in Algeria, but that baby, Aleksandar died soon after and he was buried at the military graveyard. I was named after him. For the achievements as a nurse in a military hospital she was decorated several times and we are proud that we saved them until this day. 06.In 1916 Anka eventually married Milivoje Simic in Algeria. He was a rich merchant from Trstenink. 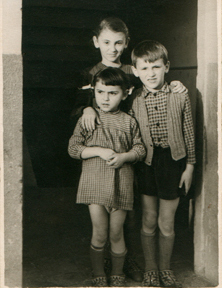 My mother was born in 1919 soon after the end of the war and their return back to Beograd. After only few years they divorced, very unusual event in those time. Anka, with her young daughter Ivanka – my mother, as a young teacher served in many village and small town schools until 1940 when second world war in interrupted their life. 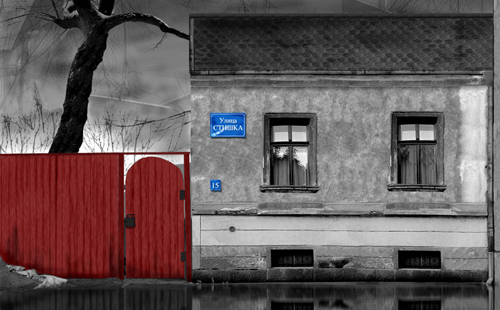 Radule was kind enough to except them back in his house in Stiska 15, and save them during the perils of the war. 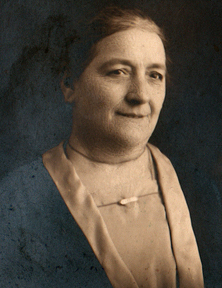 07.My mother was very active in the resistance during German occupation of Serbia from 1941-1945. We overheard my parents talking about many "actions", among others burning to the ground German garage with transport vehicles, actually not that far away from this house. That's how she met my father, also active participant in the partizan resistance to Germans, very handsome professional football player. They were married in 1945, and soon after in 1946 my older sister Svetlana was born. 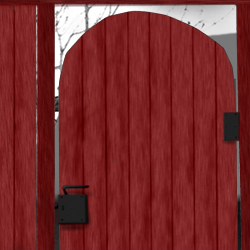 08.Life behind those red entrance doors in our yard was quite stimulating. We were still young and for us freedom to run around or climb the only large tree, was very meaningful. Fidela, our dog, always tied, unused to be petted by people, in those times it was normal to have working dog, protecting the property, played with us kids only when adults were occupied with something else and not looking. She was very old and day after day it was harder for her to stand up and play. One day, my father took her to the vet to be euthanized and that is the only sad event I remember from that period. Exploring the hidden treasures in the grand grand father former workshop was another creative option. We used this former workshop as a summer kitchen, and preparation of the food for winter and especially for me homemade fruit jams were one more opportunity for excitement. My parents were constantly frightened that I will fell in pot with boiling mixture of fruit and sugar. 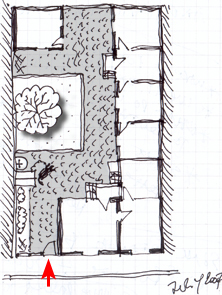 09.We lived in four rooms in the back of the house [see floor plan]. The only entrance to our part was true the yard. Room where the entrance was was serving as a living room - kitchen and it was the only heated room. There was large black wood and coal burning oven that was used both for cooking and heating in this room. You can imagine that it was our favourite spot. Rest of the rooms were heated by keeping the doors open all day and night. I remember that winters in my youth were quite cold and with lots of snow. Room where I slept with my grandmother, in very huge bed, was the last one in the row. My memory about winters and cold is actually not negative. We had very heavy woolen bed covers, and sleeping under those in that cold room was not unpleasant at all. 09.I can't recollect any other pieces of furniture in the house, except one nice two seat sofa and two armchairs made of black wood and covered in tapestry. We used them in the apartment when we moved out of this house. I don't remember seeing those anywhere in the part where we lived, they must be in the front part of the house. I don't remember that I have ever entered those rooms. In three rooms in much more "luxurious" conditions lived the second Jelena, Radules widow. 10.She was very tiny and quite unpleasant, always wearing black, morning her late husband. We never went to see her, she never went out anywhere and nobody ever came to visit her. In few rare occasions she suddenly appeared in a yard just to frighten us. Later when I grew up I always wondered how that very secretive women lived, what she was eating was there anybody helping her. In my mind she was always week and ill. Under that front part of the house there was a basement, another part of the house "off limits" to us, someone lived there, tenant helping her maybe? 11.Second Jelena didn't like us kids or anybody else in the house, probably because none of us was her relative. One day in early spring 1955, everybody was running around whispering among themselves and we new that something happened. Jelena was dead. That was a turning point in the story about this place. 12.Jelena and Radule had son Aleksandar. He was in the same way as his famous uncle Petar serving in Serbian King's army. From his first marriage in Beograd he had two sons, Vladisav and Petar, but when with his battalion he was assigned to Skopje, then south Serbia now Republic of Macedonia, he abandoned wife and kids in Beograd, married again and had son Dragan and daughter Jelena. Grandfather Aleksandar died on 19th February 1951, his second wife died even before him and those two kids in Skopje were left alone. 13.Family meeting soon after second Jelena's death decided to sell the house and the main and probably the only reason was to compensate Aleksandar's kids specially those two orphans in Skopje. In 1955 house was sold to the well known tailor and for a long time he had his store in the house. He kept red entrance door freshly repainting them regularly and every time we passed it fresh details keep coming back. 14.We passed this door very often, we had relatives very near, we played in the nearby park and years later, without actually knowing that his brother house was very close, monument to the duke [vojvoda] Petar Bojovic was erected here. 15. Recollection of this house is always tied to the red entrance door symbolizing encapsulated early youth almost completely spent in the yard, pampered by our parents but especially grandmother, we called her nana, Anka. It is unbelievable how details are coming back now. I clearly remember, and it was nearly 60 years ago, my favourite wooden toy car, yellow with red roof, that nana both for me on her trip to Niska Spa. Nana Anka spent most of her time with us while our parents were busy working with endless patience for all our wishes. 16.Life was good then and still is. House was demolished in 1970s, this is how number 15 Galsworthy Street looks today. 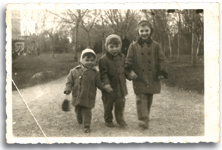 Three of us, me in the middle, in 1953. 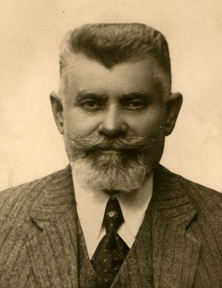 My GrandGrand Father, Radule Bojovic photo from around 1910. 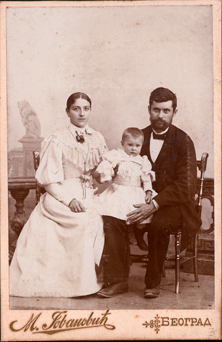 Family of my grand grand father Radule Bojovic with his first wife Jelena and my grandmother Anka, photo from 1895. Floor plan of the house, arrow is showing red door. 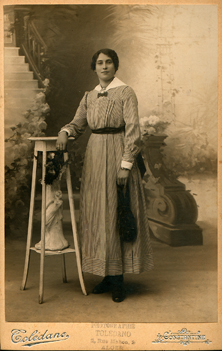 Anka Bojovic in Algeria in 1915. My mother Ivanka around 1930. 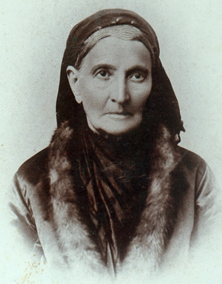 My GrandGrand Mother, Jelena Radules first wife. Jelena Bojovic, Radule's second wife. This is how I remeberd her, photo is from around 1930. Aleksandar Bojovic, Radule's and second Jelena's son. Photo is from around 1936. 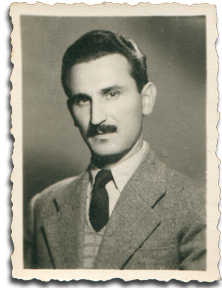 My father Slobodan around 1947. 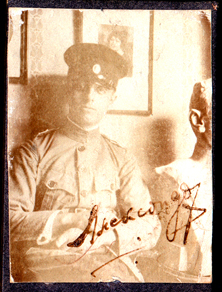 Vojvoda Peter Bojovic as a young solder. 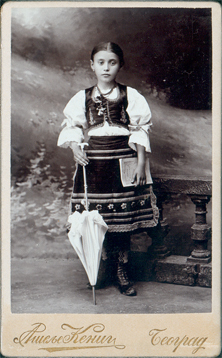 Photo is from around 1900. Iscription "To the memory for my brother Radule and his wife Jelena". 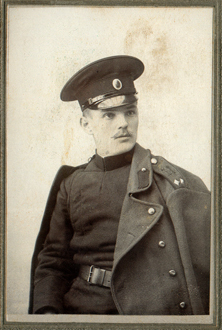 Vojvoda Peter Bojovic around 1918. Me and my sisters in 1956 year after we moved from this house. 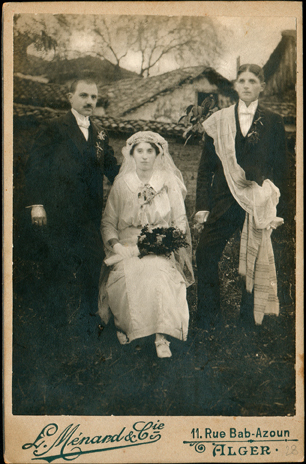 Nana Anka Bojovic and Milivoje Simic, wedding in Algeria, 1917. 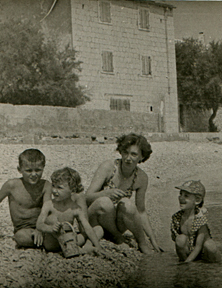 My mum, my sister Svetlana in 1950 in Brela, year before my other sister was born. Kid at the far right is unknown playmate.